"The love of learning - The sequestered nooks -- and all the sweet serenity of books." 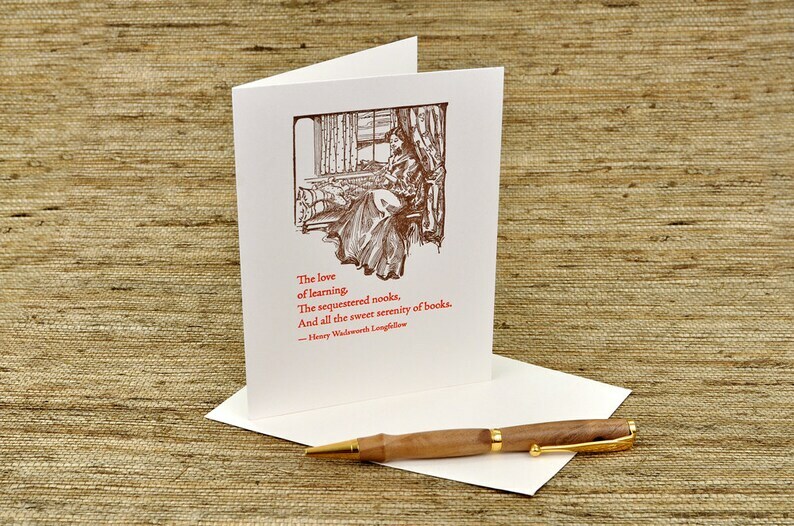 This biblio-friendly quote from Henry Wadsworth Longfellow is letterpress printed in warm red ink, accompanied by a serene brown image of a woman reading in a windowseat. Printed on cream colored stock. Soy ink, 100% post-consumer recycled cardstock. Size is approximately 4.25 x 5.5 (A2), with matching envelope. I read the poem this is from in one of my classes, and fell in love with it. I was excited to find it on a card! Beautiful cards. Thanks so much. Really really lovely — thank you! We accept PayPal, as well as personal checks and money orders. Nothing will be shipped until payment has been received. If payment is not received within three business days, we will send a gentle reminder via e-mail. If payment is not received within two weeks, we will cancel the transaction. We want you to be happy with your purchase. If for some reason you are not satisfied, please contact us for a refund or replacement item. We are only human, and we sometimes make mistakes. When we make a mistake, we do our best to make it right. Please contact us for resolution before leaving negative or neutral feedback. We usually ship within two business days, via first class mail. Most people in the U.S. will receive their items in less than a week. If you need something faster, please convo us *before* you place an order. International shipments of one or a few cards mail in an envelope within two business days. International shipments of larger items may take several days to ship. If your international order is over 13 ounces, we are required to stand in line at the post office and fill out customs forms, so I batch these shipments and go once a week to the post office.